Finding the best stainless steel garbage disposals can be tricky. There are so many on the market that eventually, you may think that their features have begun to blend together. Thankfully, the seven on this list of the best stainless steel garbage disposals makes things easier. These models have been carefully reviewed to ensure that their noise levels are low, their installation process is easy and that their gears and grinding chambers do what they’re supposed to. 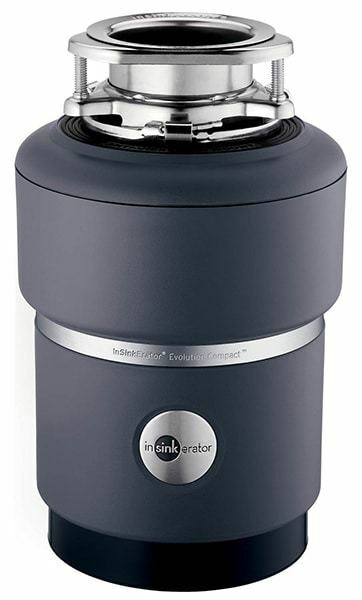 The InSinkErator Evolution Excel is one of the bests stainless steel garbage disposals because it’ both powerful and quiet. This garbage disposer is kind of like the “Rolls Royce” of kitchen appliances. It really gets the job done well! The InSinkErator Evolution Excel has a 1 horsepower motor. It uses a special multi-grind technology that sends your food waste through three different grind stages before it’s sent through your plumbing system. This garbage disposer has a 40-ounce stainless steel grind chamber, as well as SoundSeal technology, which ensures that it’s very quiet when running. This particular model also has a seven-year warranty where the company will come out to handle any repairs. 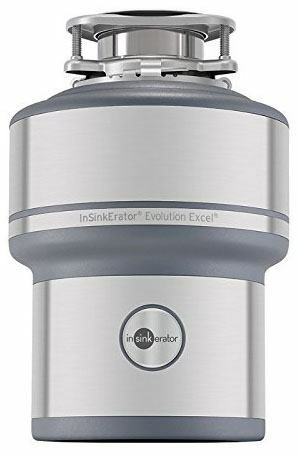 Overall, the InSinkErator Evolution Excel weighs 25.5 pounds and measures 13 inches by 12 inches by 12 inches. This model – the Waste King Legend Series ½ Horsepower Garbage Disposal, is one of the best stainless steel garbage disposals, simply because its installation process is so simple. The company prides itself on producing garbage disposers that the standard homeowner can install. 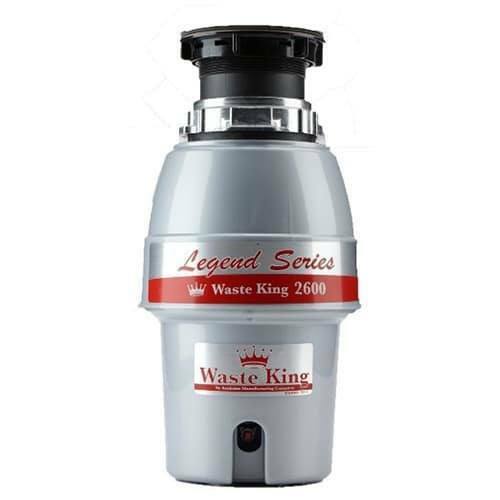 The Waste King Legend Series ½ Horsepower Garbage Disposal is quite impressive. It comes with everything that you need to complete the installation process, including a power cord and an EZ mount. The stainless steel garbage disposal flange is designed to work with any plumbing system, including septic systems and people who have dishwashers in their kitchens. The unit is compact and sleek and comes with a five-year limited in-home warranty. It weighs a mere 7.8 pounds and measures 6.8 inches by 6.8 inches by 13.5 inches. It’s a continuous grind model, which means that you won’t have to let the food waste build up before running the machine. Honestly, the ease of installing this garbage disposer is what makes it so great. The Moen ½ Horsepower Garbage Disposal, part of their GX series, made this list of the best garbage disposals because of its sleek design. 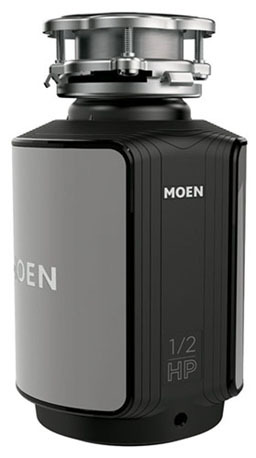 Moen made sure that this garbage disposal looked like nothing else on the market. The Moen ½ Horsepower Garbage Disposal has ½ horsepower motor (hence its name). This appliance is a garbage disposal with stainless steel grind chamber, and it uses 115 volts of power in order to grind up food waste at 2,600 RPM (rotations per minute.) The installation process is fairly simple, as long as you have a three-bolt mounting system in your sink, and although this garbage disposer is designed to work best with other Moen components, it will work with any sink that has the right set up. It comes with a pre-installed power cord and uses Moen’s SoundShield technology in order to keep the noise levels down. It also comes with a four-year limited warranty. 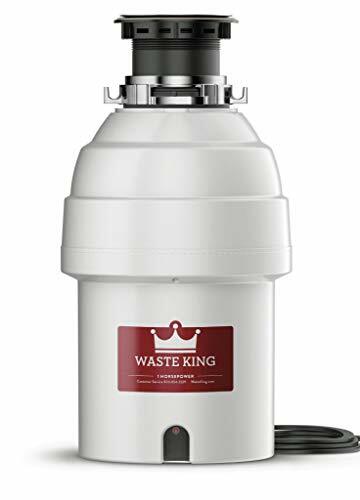 One of the best stainless steel garbage disposals, the Waste King ½ Horsepower Garbage Disposal is extremely powerful, easy to install, and very quiet. It checks off all three boxes on the list! 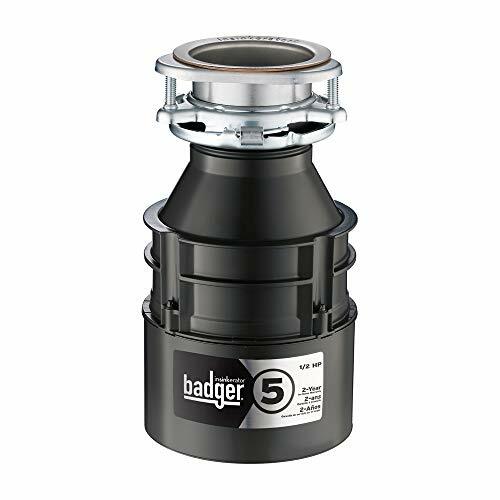 The Waste King 1 Horsepower Garbage Disposal weighs 16 pounds and measures 8.8 inches by 8.8 inches by 15 inches. It was designed with Waste King’s patented Snap and Lock installation system, meaning that you should have very little trouble (if any) installing it in your kitchen. 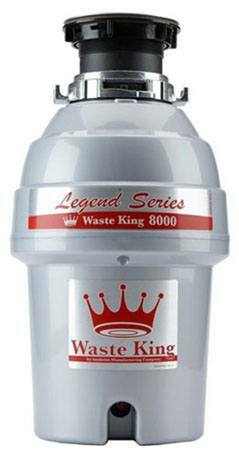 The machine also is part of Waste King’s Legend series of extremely quiet and reliable garbage disposals. It uses their exclusive Silencer Technology to ensure that you can have a conversation in the room while it’s running. The BECBAS Element 7 Garbage Disposal made this list of the best stainless steel garbage disposals because it’s a flashy red model that will stand out in every kitchen. Sometimes you need a kitchen appliance with a little pizzazz. We listed this as possibly the best stainless steel garbage disposal because the BECBAS Element 7 Garbage Disposal is easy to install, quiet, and lightweight. This model is fairly large – it measures 15.4 inches long – but it more than makes up for this with its high-speed motor, stainless steel grinding system, and accessories kit. 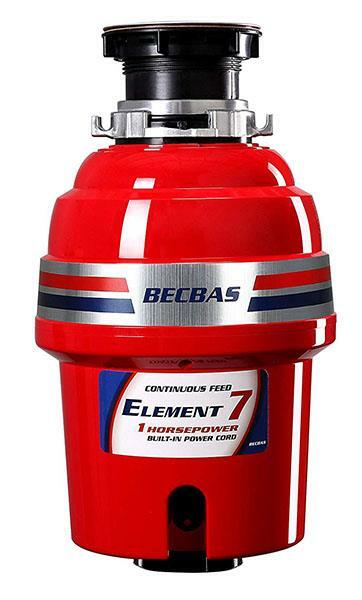 The kit includes everything that you need to install the BECBAS Element 7 Garbage Disposal, including a power cord, a splash guard, and an elbow connector. It also comes with a drain stopper and a scraper, just in case. 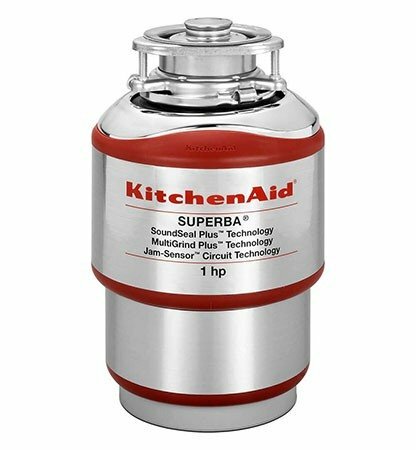 The KitchenAid KCDS100T is designed by one of the leading kitchen appliance producers, which is why it’s on this list of the best stainless steel garbage disposals. It has all of the reliability that you’ve come to expect from KitchenAid. The KitchenAid KCDS100T has a continuous feed design, as well as a one horsepower motor that runs at 1,725 RPM. This appliance uses sound seal technology to ensure that it’s so quiet you can have a conversation in the room while it’s running. It comes in a snappy red and silver combination, weighs a mere nine pounds, and measures 10 inches by 8.5 inches by 12.8 inches. It’s made entirely of stainless steel, which means that it should last for quite some time. However, it does not come with a power cord, making installation a bit challenging. All of the best stainless steel garbage disposals on this list have some pros and cons, and the KitchenAid KCDS100T is no exception. 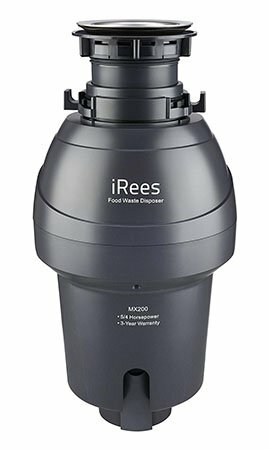 The iRees MX200 5/4 Horsepower Garbage Disposal is one of the best stainless steel garbage disposals simply because it has such a powerful motor. If you’re concerned about your current disposal’s ability to get the job done, then this is a good model for you. The iRees MX200 5/4 Horsepower Garbage Disposal is sleekly designed so that it will stand out from everything else that you have stashed in your kitchen cabinets. It’s black, bullet shape is very modern. This garbage disposal is 18.1 inches by 9.8 inches by 10.1 inches. It weighs 12.95 pounds. The 5/4 horsepower in the name means that its motor runs at 1.25 horsepower and 2,600 RPM. It comes with a limited 1-year warranty and the manufacturer claims that you can even use it to pulverize chicken bones. It’s quite impressive! On top of the powerful motor, this garbage disposal is fairly quiet and easy to install. It even comes with a built-in power cord. The best stainless steel garbage disposals are those that work reliably. They have powerful motors, yet produce low noise levels. These disposals have a simple installation process, and some even come with everything that you need in order to install them. 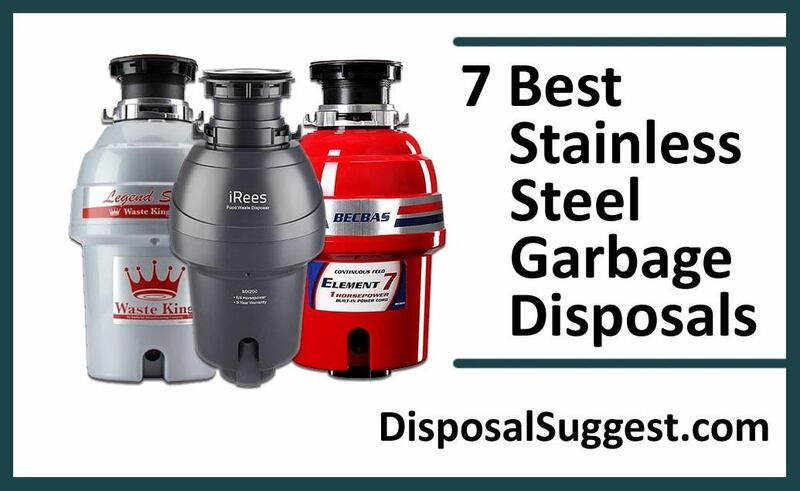 The seven on this list are some of the best stainless steel garbage disposals on the market. If you’ve been searching for a new one for your kitchen, you need to start here.